Electric Pressure Washer . . . The EPW-1500 is our compact pressure washer. 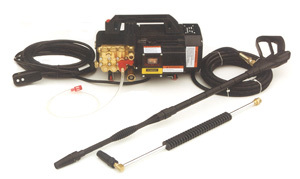 This unit has variable pressure control (100-1450psi.) and 2.2 gpm. for quick efficient cleaning. Two multi-spray nozzles extensions, one straight and one 90° right angle for cleaning heavy-duty dirt indoors and out. Fast and thorough in cleaning grime, dirt, and other materials from sidewalks, walls, etc. Faster water injected sandblasting for cleaning grime, dirt, and graffiti. Cleans drains, sidewalks, machinery, etc. What makes our pressure washers better?